NOTE: All driveshaft assemblies are balanced. If undercoating the vehicle, protect the driveshaft to prevent overspray of any undercoating material. A tubular shaft used to transfer engine torque from the transmission output shaft to the differential in the rear axle housing, which transmits torque through the axle shafts to the drive wheels. Consists of two single-cardan universal joints, a driveshaft slip yoke, a welded tube assembly and a driveshaft centering socket yoke. 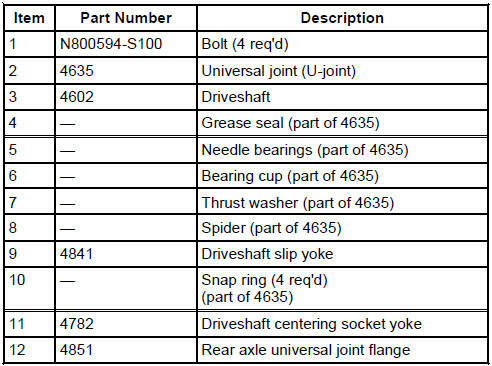 The splined driveshaft slip yoke permits the driveshaft to move forward and rearward on the transmission output shaft during drivetrain movement and during driveshaft removal and installation.